If you are a user of Microsoft Dynamics CRM hopefully you are familiar with the great educational Dynamics CRM User Group – CRMUG. Through online communities, local user group meetings, the annual Summit Conference, CRMUG provides users of Dynamics CRM a way to not only stay informed of the latest and greatest of all things CRM but also to share their knowledge. 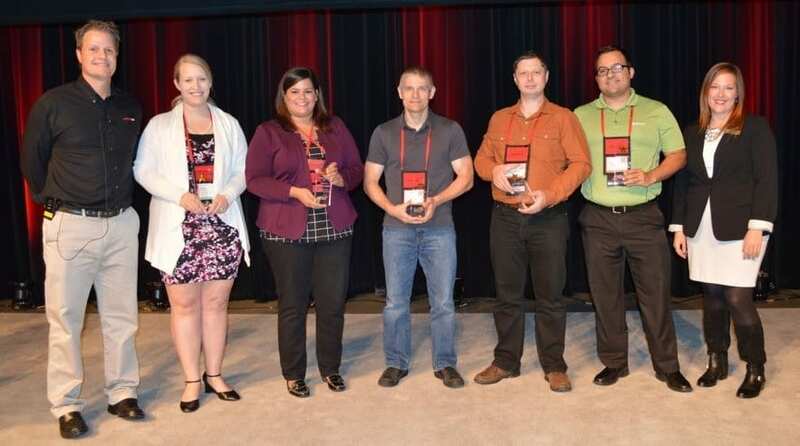 At this year’s CRMUG Summit, held in St. Louis, MO on October 14-17, 2014 the first-ever CRMUG All Star awards were announced. This inaugural group consisted of five members who show a passion for Dynamics CRM and make significant contributions of their time and expertise to educate the rapidly increasing CRMUG community. Among those honored this year was Ledgeview’s own CRM Development Consultant Jason Lattimer. Jason, a recognized Dynamics CRM MVP, is a consistent contributor to multiple CRM blogs, a speaker at chapter meetings, annual conferences (he did 4 sessions at CRMUG Summit 2014) webinars and onsite events. Next up for Jason on the presentation circuit is leading several Microsoft Dynamics CRM sessions at Ledgeview’s CRM Conference October 30th in Milwaukee (you do still have time to register). Congratulations to Jason and all the CRMUG All Stars who are pictured below with CRMUG Program Director Tony Stein (far left) and Laura Hoverson, Program Coordinator (far right). The All Stars are: Britta Scampton (BGM TruNorth Partners), Zara Kamruddin (CLEAResult), Jason Lattimer (Ledgeview Partners), Adam Vero (CRM Masters) and Gus Gonzalez (Zero2Ten). Looking for some awesome insight and user tips? Check out some of Jason’s posts here on our blog and subscribe to stay up-to-date on new ones that are typically posted at least once a week.